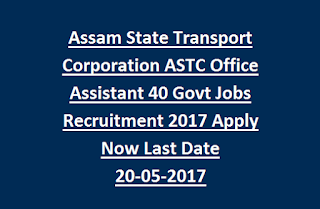 go through the Assam ASTC website @ http://www.assamstatetransportcorporation.com/career/career-apply/ to apply for these Office Asst Jobs. Candidate must have to upload scanned copies of Medical Certificates, ID Proofs along with application through online. Total available vacancies in Assam ASTC recruitment are 40 posts, which are going to be filled on merit basis of candidate performance in written test. Last date to submit ASTC Assam online Applications is on or before 20-05-2017. 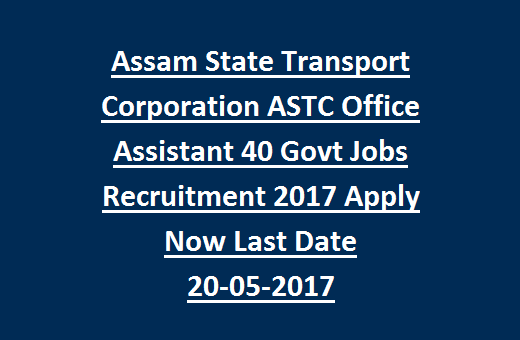 Further details regarding Assam State Transport Corporation ASTC Recruitment 2017- Application procedure, Salary, Age Limits, Exam Dates, Educational Qualifications and other details are mentioned below. See the official advertisement of Assam ASTC Office Assistant Jobs Recruitment. Closing date for submission of ASTC online Application: 20-05-2017 (05.00 PM). Post Name: Office Assistants- 40 Posts. These vacancies are reserved for Physical Disabilities having persons. Fixed monthly salary for the post of Assam Office Assistants is Rs.8000/- plus allowances applicable as per Govt Norms. Minimum Educational qualifications for the Office Assistants candidate must have passed Higher Secondary Examination. Computer Literates will be preferred. Candidate minimum age should not be below 18 years and upper age should not be above 43 years as on 01-January-2017. Upper Age relaxation for SC and ST candidates is 05 years and for OBC category is 03 years applicable as per Assam Govt rules. Candidate applying for Assam ASTC recruitment 2017 jobs will be shortlisted based on written test. There will be no Interview. Written test date will be intimated soon through SMS to the registered mobile no and published on ASTC website. No application fee to apply for these vacancies. Interested Indian citizens (PWD) may go through the official web portal of ASTC @ http://www.assamstatetransportcorporation.com/career/career-apply/ to apply for current recruitment. Candidate must have to upload filled application along with Scanned copies of Medical Certificate, Identity Card before closing date. Last date for submission of online applications is on or before 20-05-2017 before 05.00 PM. Please share this Assam ASTC Office Assistant Jobs Recruitment Examination 2017 article to your friends via social web sites.